Pastor Craig for final information. 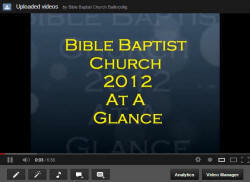 Watch our 2012 Year in Review! 2nd – 4th Ladies’ Retreat in Wicklow This is a Christian Woman’s get-away for those 18 yrs and older! Held in Oavoca, Wicklow, this is a time of spiritual rest that cannot be missed! Cost is €100. Today, we as a church will look ahead to 2018. Each year, God calls us to go just a little further, and trust Him just a little more. So, we will need more faith than ever to do His will! Let’s catch the vision, and watch God do great things through our faithful church! Nursing Home Carolling Our Christmas visit of the Powder Mills Nursing Home is a highlight for many of the residents, and has an eternal effect because of the Carolling and the Gospel presentation. Young and old are invited to come along and be a great blessing! Christmas Carolling in the Ballincollig Shopping Centre! 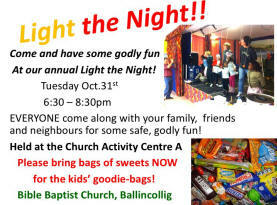 Christmas is our chance to make sure folks throughout Ballincollig know the Christ of Christmas! We need everyone to come along and help us sing, hand out tracts, and be a living testimony of the gift of eternal life to literally hundreds who otherwise may never hear the good news… that a Saviour has been born, and came to save them from their sins! at Dan and Kathy’s home Before all the rush of the Christmas season takes over, this get-together allows our ladies to take a moment and minister to one another with a special time just amongst themselves. Expect a blessing! This is an absolutely marvellous presentation of the Christmas Story in song! Everyone is so welcome to come and enjoy the wonder of that first Christmas! The Cantata will be presented Sunday morning at 10.30am. You will want to bring your whole family! Every Christmas, on Christmas Day, we gather at 11am for just one hour to praise the Lord for giving us His Son! Remember, Christmas is all about Jesus, not just us! So, bring everyone that you can to this special gathering on Jesus’ birthday! 8pm-Midnight Our New Year’s Evening Activity will help us as a Church dedicate 2018 to the honour of the Lord Jesus! It will be awesome, with singing, preaching, games, worship and praying. Don’t forget to bring finger-foods and expect an evening of fun! All the Ladies are invited to get together for a great time of fellowship! All are encouraged to come to pray together as a church. Will YOU come along and seek God’s power for our church and ministries? This is our main time of prayer as a Church, and we gather and spend an hour learning of people’s needs, and then praying for those needs in small groups! Come, and learn that you can safely lean on the strength of the Lord Jesus Christ! Following the prayer meeting time, we have a short Tea Break, and then we get down to the Bible Study time. We go through the Bible, verse by verse, and learn so much! Everyone grows as they learn this way! We currently have 16 people involved in getting discipled (learning the Bible), and there is room for more to join in! If you are interested in learning God's Book, the Bible, please contact Pastor Craig and make an evening available to study, and you will soon have the tools you need to live for the Lord Jesus Christ, who loved, you, and saved you, and wants to use you! Discipleship - it's more than learning! A third-level training institute, that prepares the Christian to serve the Lord better through intense learning of the Bible. Various courses are available that help the student to prepare to preach, pastor, teach, and grow in their faith. Open to the Public, but there is a small fee. Time for fun, and fellowship for the teens in our church. This also is a key opportunity for the teens to invite their friends to hear the Gospel and get born again! It really is great being young and excited about the Lord! Every Saturday afternoon, at 1pm, for about an hour and a half, faithful Christians are presenting the Good News of the Gospel to people throughout the Cork area in order to see souls saved, and our generation reached. Will you help? The fields are white unto harvest – so who is going to go and reach our generation with the great news of the Gospel if we don’t? Everyone young and old can win a soul if they would just go with a bit of training, and a lot of passion! Come out and start making a difference! Make sure you make this church… YOUR CHURCH!